The silver market followed gold lower yesterday having initially risen in earlier trading, ending the session with a narrow spread down bar, but with a deep upper shadow, suggesting that the price of silver is likely to fall in silver trading later this morning. The fall in silver prices on the daily chart was less dramatic than that of gold, but nevertheless, yesterday’s ‘shooting star’ candle was an unwelcome signal for silver traders, particularly as the high of the day failed to breach the $14.50 per ounce level once again, and in addition closed below both the 9 day and the 14 day moving averages. 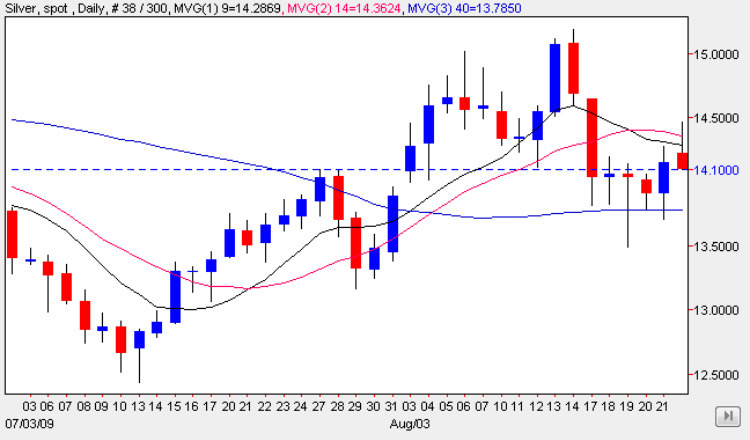 Given that the high failed to breach the strong resistance at this level, we must therefore conclude that today will be a bearish one for silver trading, but the 40 day moving average may come to the rescue of silver bulls once again. However, should this be broken then we could see a much deeper move possibly to re-test support at the 13.50 region once again. My silver trading suggestion for today therefore is to look for small short positions intra day, with a stop loss well above the $14.76 price level, and with small profit targets as we move lower in early trading.